Post #25 - Costa Rica, Part 2! Part 3 still to come! In the last entry, I wrote briefly – well, maybe not-so-briefly – about my general impressions of Costa Rica and my experiences as a first time visitor to the country. In this entry I will spend my words on the birds that I saw during the first 3.5 days of our trip. As this escape was planned only a week in advance, I was admittedly underprepared from an identification standpoint. This actually made for very relaxing birding. Unconcerned about finding every possible species, I was simply content to enjoy whatever birds crossed my path on my daily walks. I did mange to scrape out 144 species in the course of my stay, and more importantly, experience at least a sample of the country’s amazing diverse birdlife. We spent the first 3.5 days southeast of San Jose. High in the cloud forests of San Gerardo Dota (7200’), I got my first taste of Costa Rican avifauna at The Savegre Hotel, Natural Reserve and Spa. 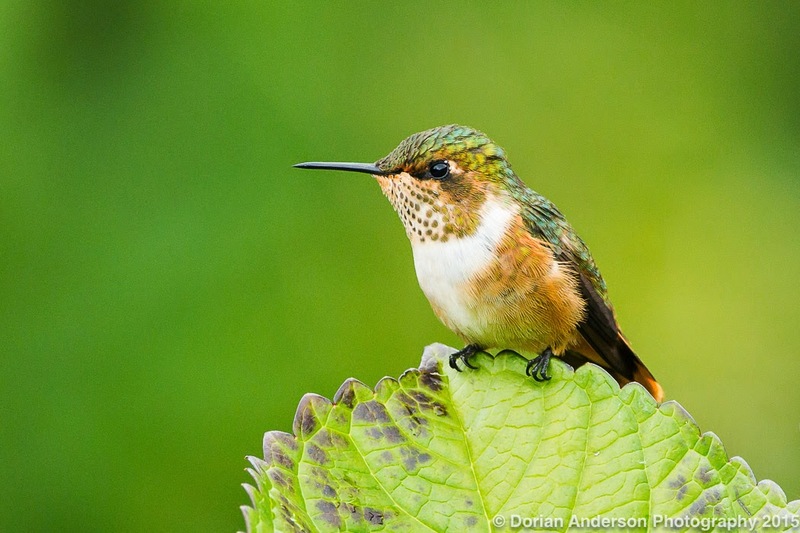 Hummingbirds were prominently featured with Magnificent, Green Violetear, White-throated mountain-gem, and Striped-tailed hummingbirds dwarfing the endemic Volcano and the miniscule Scintillant. These 6 species, and only these 6, were perpetually buzzing around the lodge’s many feeders. Besides nectar, the lodge additionally put out fruit for the birds each morning. 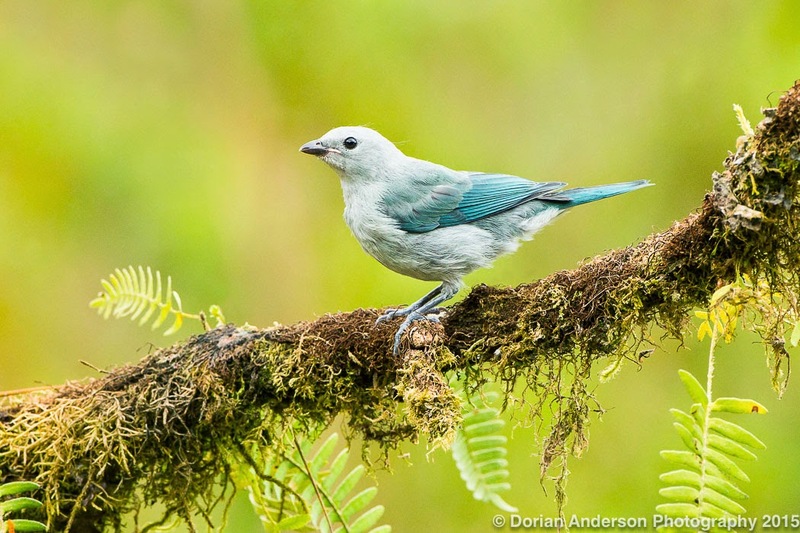 This buffet attracted several tanager species including Silver-throated, Flame-colored, and Blue-gray. 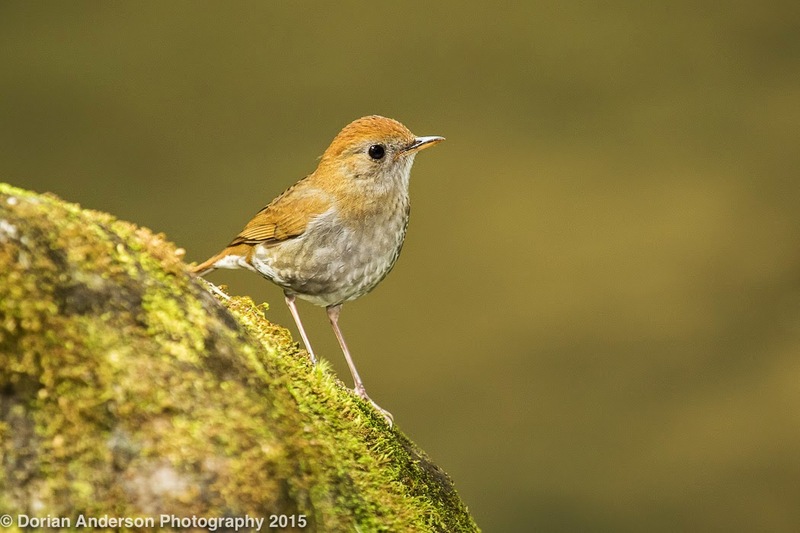 Rufous-collared sparrows, Ruddy-capped nightingale-thrush and Clay-colored thrushes hopped everywhere. Slaty flowerpiercers were bounced from flower to flower, and the fruit tree just outside our room attracted numbers of Long-tailed liky-flycatchers and Mountain elaenias. I scarcely had to move that first afternoon to find all these great birds. Scintillant hummingbird - just 3" long! 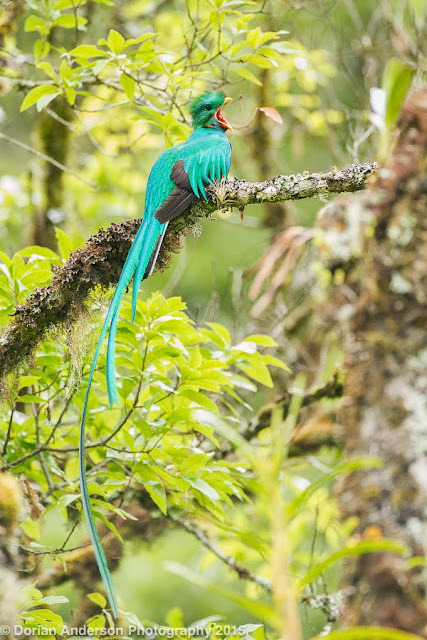 Day 2 was devoted to finding the Resplendant quetzal, a specialty bird of the Costa Rican highlands and arguably one of the most beautiful birds in the world. With the help of a local guide, we visited a known quetzal nest. We missed the birds on our first pass through the area, but the male appeared directly overhead a few hours later. He perched and foraged just 40 feet from us, even affording us flight views as his meter long tail flapped breathtakingly behind him. That morning, we also found Spotted wood-quail, Rufous-browed peppershrike, Emerald Toucanet, Spot-crowned woodcreeper, Yellow-winged vireo, Collared redstart, Spangle-cheeked tanager, White-napped brushfinch, and Elegant (formerly Blue-hooded) euphonia. Even as relatively novice birders, Sonia and her mom could appreciate the mind-boggling beauty of these species. Resplendant quetzal - almost 3 feet long! 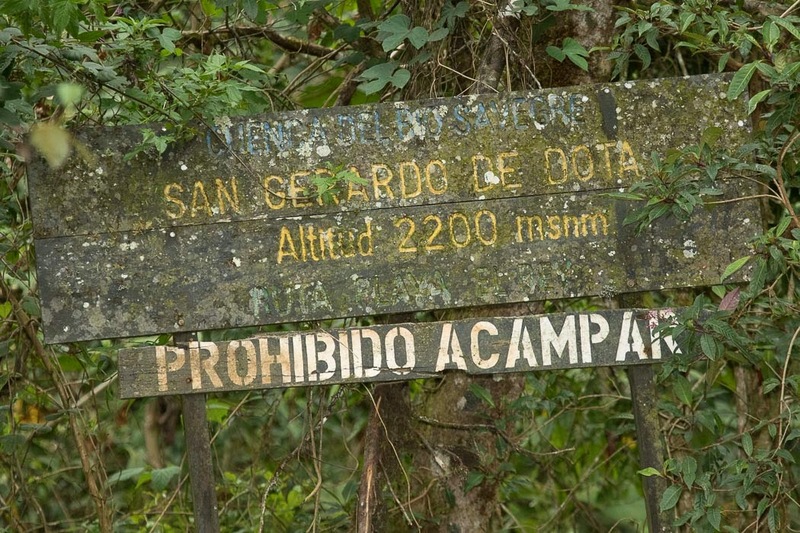 Our last morning at San Gerardo was spent on a series of short hikes. On these we added Yellowish flycatcher, Barred becard, and Common Chlorospingus. We also found 2 more quetzals. One was clearly incubating eggs as all we could see for the hour that we were in the vicinity was his two longest tail feathers sticking out of then nest! That afternoon we ventured up to Mirian’s café on the entrance road to San Gerardo. Here I added higher elevation species such as Sooty thrush, Large-footed finch, and Firery-throated hummingbird. The last of these was particularly stunning, even though I managed only a 5 second look at it. I could go on forever about our time at San Gerardo. It was beautiful, quiet, and birdy. I think the timing of our trip was just perfect in these respects. The crowds of the dry season long departed, we saw scarcely anyone in the lodge or on the roads and trails in the area. May is a shoulder month between the dry and wet seasons, and we really lucked out with the weather. We did have afternoon thunderstorms each day, but these cost us at most and hour and half of birding each day. They actually provided us, particularly Sonia’s mom, a chance to rest before the next outing. Here are my eBird Checklist from our time at San Gerardo de Dota. Post #24 - Costa Rica, Part 1 - Quite long! Sorry for the long absence, but writing while in Costa Rica (or while preparing to leave) proved impossible! Between somewhat limited internet access and virtually limitless birding opportunities, I didn’t slow down enough to write a thing this past week! As I am now on the plane home, its time to crank out what I hope will be the first of two blog posts recapping this trip. The first of these will focus on my general impressions of Costa Rica and suggestions I have for future travellers. The second will specifically highlight the birds that we saw during the two major phases of our particular trip. 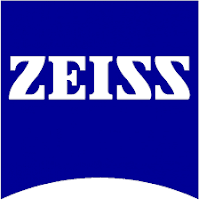 I will also mention some of what worked and that which did not work from a photography standpoint in that second point. This last-minute, 8-day sprint was, almost unbelievably, my first foray into the tropics in nearly 30 years of birding. I did admittedly spend 9 days birding in Northern Mexico on one of my Victor Emanuel Nature Tours youth camps, but even that episode was nearly 20 years ago (ugh, I feel like a dinosaur writing that). Both Sonia and I start new jobs this week, so it made perfect sense to escape while neither of us was working. As an added bonus, we brought Sonia’s mom with us. This meant this trip was as much about family as it was birding. We managed to see a ton of great birds, experience a really wonderful country, and spend some really nice family time together. We divided the trip into two parts – the cloud forest in San Gerardo de Dota and the lusher areas around Arenal National Park. As this was our first visit to the country, we figured we didn’t need to run ourselves ragged moving from place to place. This proved correct and made for a very relaxing introduction to Costa Rica. As we discovered, staying at all-inclusive eco-lodges ensured great birding without the need for much daily travelling. It also ensured access to non-birding activities for those that needed a break from bird-centric activities. There are many reasons besides its amazingly varied habitats and approximately 850-900 bird species that Costa Rica is a prime birding destination. First, the country is very politically stable and the people are very friendly. That the country formally abolished its military in 1948 speaks generally to both points. Second, Costa Rica is very small (about the size of West Virginia) and easy to navigate. We had zero issues finding anything using Waze or Google navigation tools on a phones (it cost $30 to activate an international data plan for the week). Third, Costa Rica is relatively inexpensive. Yes, it is the most expensive country in Central America, but the aforementioned stability and hospitality understandably come with a price. As an aside, we used dollars for just about everything. Fourth, the country displays a great respect for all things natural and has constructed its tourism industry around this sentiment. I will round out this blog entry with a more in depth discussion of some of these points. Absolutely everyone we contacted during our stay was incredibly friendly and, when required, willing to help. This included not only the staff at our eco-lodges, but also the people with whom we interacted beyond their admittedly protective confines. 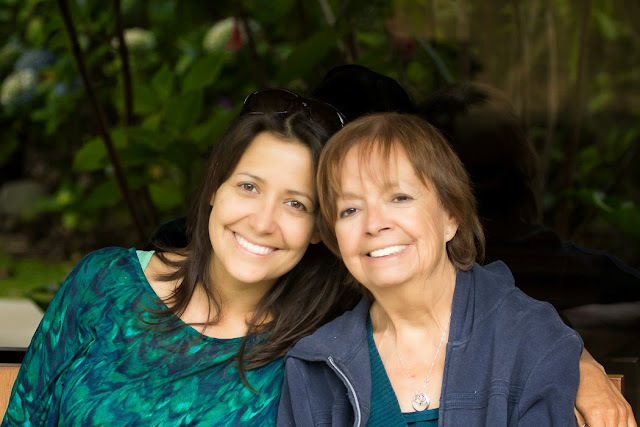 Both Sonia and her mom are fluent in Spanish. I took 4 years of high-school Spanish and possess a basic ability to understand what is being discussed in casual conversation. Spanish is certainly not a prerequisite for visiting Costa Rica, but it did allow us an interesting window into the country’s people that I think those who don’t speak any Spanish might miss. Nowhere was this on better display more than at a dinner we had at a local ‘soda’ in San Isidrio. Serving typical rice-and-bean-based local fare (‘comida typica’), this small roadside restaurant and fruit stand, or ‘soda’, provided the perfect opportunity to interact with some local folks. Joined, without initial invitation, at our table by the husband-and-wife owners, we quickly welcomed the chance to speak with them about the local area, the local people, and the country in general. Without going into too much detail, what we general took away from this conversation is that most Costa Ricans are thankful for what they do have and not in want for that which they don’t. They are content with a pace and style of life that many from more developed countries might pejoratively label as basic. 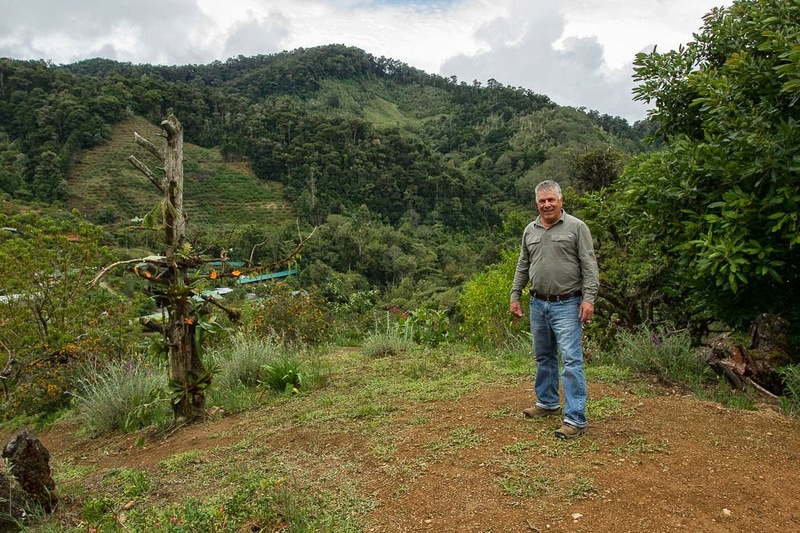 Material possessions seem to take a back seat to family and experiences, and there seems to be a general respect for the natural world on which many of them rely for their income – either directly as farmers or indirectly through eco-tourism. Take away point: This couple, like all the folks we met, was simply wonderful. Costa Rica is blessed with an amazing array of habitats. 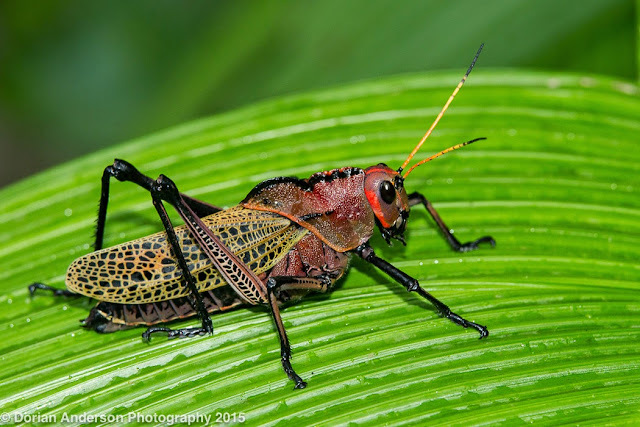 These range from cloud forests, to rainforests, to lowland foothills, and to marshes and beaches. The diversity of habitats explains the astounding array of birds that can be found within the country’s borders. As Costa Rica is so small, it is exceedingly easy to move between several of these areas in even just a short stay. We elected to do this by car. We rented an economy model, a Toyota Yaris. This proved to be a very wise and completely painless decision. You do not need to rent an SUV to get around in Costa Rica. We found Costa Rican drivers to be quite courteous. At no point did we feel that we were going to get pushed off the road – even in our tiny car. While there are zero traditional freeways, there is a decent network of paved main roads that can be used to get to wherever you need. As most of them are a single-lane in each direction, traffic generally moves slower than it does on multi-lane highways. San Jose seems to be a perpetual snarl, but most visitors are likely to quickly exit the city in favor of other areas anyway. Many of the more rural side roads are dirt and can admittedly be a bit rugged, at least over stretches. Those who don’t mind being bounced around a bit (like us) should be able to navigate all but the worst of them in a standard sedan. Our Yaris handled even the ride up to Arenal Observatory Lodge without incident. Many folks had said we needed 4-wheel drive to reach that point – complete hogwash. Take away point: Getting around is quite easy provided you aren’t in a rush. 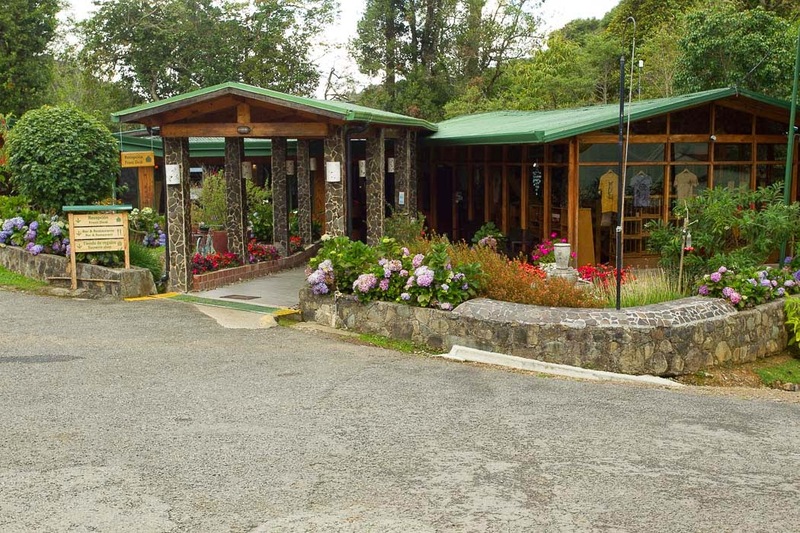 As this was our first visit and since we had Sonia’s 69-year old mother with us, eco-lodges provided the perfect introduction to Costa Rica’s birds, plants, and animals. We stayed at the Savagre Lodge in San Gerardo de Dota and the Finca Luna Nueva Lodge and Farm near Arenal. As our general experiences at both of these all-inclusive type lodgings were similar, what I say below applies to both and should extend to similar accommodations. Lodges have restaurants on-site; These 2 were no exception. We hardly needed to use our car once we reached the lodges. The staff at both places had whatever answers we needed and generally went to great lengths to ensure that our stay was pleasant, stress-free, and educational. As for the physical side of things, the grounds at both of these lodges were exquisite. 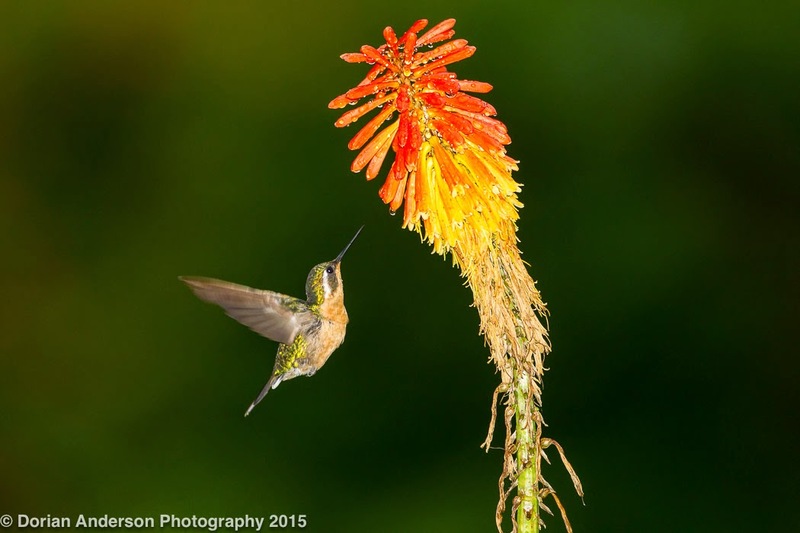 Hummingbirds, toucans, tanagers, and honeycreepers could be seen right from our front porches at both places. I scarcely had to move to find amazing birds. Gray-necked wood-rail walked out from our parking space at Finca Luna. Both of these lodges had their own private reserves, and we could fill up most of the day simply drifting between the various trails that snaked around the properties. This arrangement would let me bird for a few hours, then return for family time and meals. Sonia and her mom accompanied me on some shorter walks, but they also made time for spa treatments and make-your-own chocolate experiences as well. What activities not directly provided by the lodges can be easily organized with their help. Both lodges had onsite bird guides available for private tours or the more general “I saw this bird that looked like this……”-type consultations. Take away point: Lodges make birding easy while accommodating non-birders as well. Costa Ricans certainly recognize both the present and future value of environmentally sustainable travel. This appears true from the industry level down to the individual. 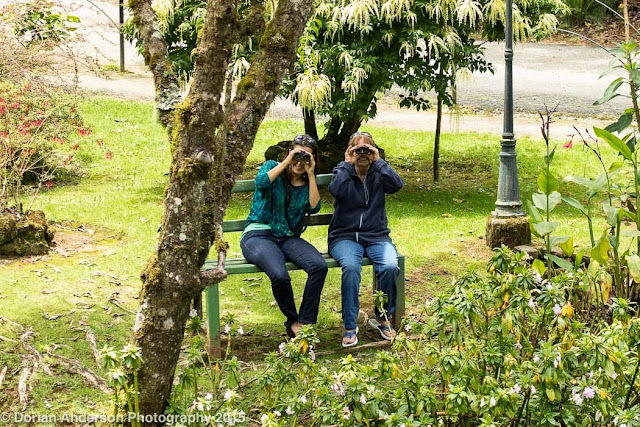 Both Sonia and I remarked that many Costa Ricans seem to have a general interest in birds, animals, and plants. This might not seem surprising given the riches of each in the country, but all too often nature’s wonders are somehow taken for granted. That Costa Ricans seem to have avoided this pitfall speaks to their appreciation for all things nature. The attitude is echoed and supported by a government that has set aside an astounding 26% of the country’s lands for conservation. Besides San Jose, the country generally feels perfectly underdeveloped. With just 1.76 births per woman as of 2014, population growth and associated human development is unlikely to be a major problem in the foreseeable future. A commitment to recycling seems the national norm; Everywhere one turns, specifically in these eco-lodges, there are helpful reminders of how and where to dispose of what. Take away point: Costa Ricans understand that people will visit their country and enjoy the biodiversity provided that it is protected. Sonia and Yolanda spy a very odd bird! 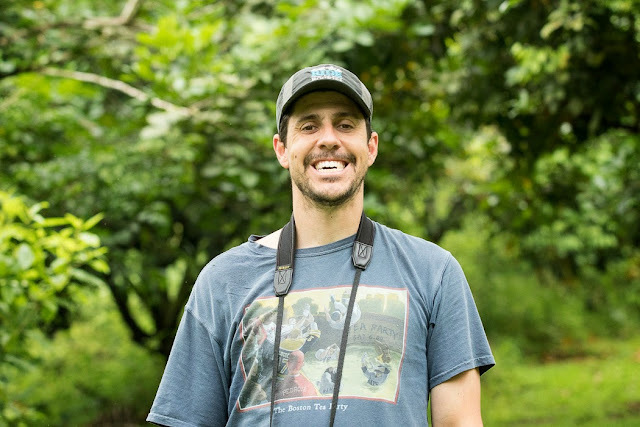 The bottom line is that Costa Rica is as great a travel destination for the Latin American newbies (such as ourselves) and more seasoned Central and South American birders. Both Sonia and I want to spend more time in Costa Rica in the future, and there is no doubt in my mind that we will. As it is a very easy 5.5-hour plane ride from LA, we might find ourselves back there sooner than we even realize! In the next entry, I will focus on the actual birds that we saw during the two phases of out trip. Please stayed tuned! Until then, enjoy this grasshopper! Post #23 - National Bike Big Day record falls - TWICE!!! Prior to this week, the national Bike Big Day (BBD) records stood at 181 species. This record was shared by two groups. Groups 1 is a San Francisco-based team consisting of Josiah Clark, Rob Furrow, and Andy Kleinhesselink. Group 2 is a Texas-based duo of John Hale and Ron Weeks. Interestingly, these two groups achieve 181 species on the same day, April 20, 2013. Both teams fell short of this mark in 2014 but exceeded it this spring. On April 18th of this year, The Texas Team found 193 species. Nine days later, on April 27th, Team SF (minus Andy) found 187 species. Both groups should be acknowledged for their incredible efforts and results! As I have standing invitations to join each of these groups moving forward, I hope to find the time to join one or both fo them in the future. It would be great to be a part of a similarly exciting and successful BBD in the future! Below I have posted the official recaps as authored by both teams. Their first-hand accounts will be much more interesting, accurate, and authentic than anything I could possibly recount on their behalf. Its very cool to see just how different the different species lists are! John Hale and I began our 2015 Bicycle Big Day effort near the town of Orange Grove, Texas just before 0500 hours on April 18. I had spent the past few weeks scouting the new route – one used annually by Jon McIntyre and Steve Taylor for Car Big Days. We would not be able to move as fast as a car team, but we would have the advantage of listening for birds during the entire day. I felt it had an excellent shot at breaking the current national record for bicycles of 181 species – ironically set by us in Texas and a team of Bay Area birders in California on the very dame date two springs ago. Our first bird of the day was a Great Horned Owl. We would add Eastern Screech-Owl, and Common Pauraque before mounting our bikes for the first time. It was just less than 3 miles to our dawn starting spot. But before the sun began to rise, we added Common Poorwill and both Lesser and Common Nighthawks. The dawn chorus - a bit retarded due to the heavy overcast - began in earnest at 0620 hours with the addition of two key birds we could get nowhere else on the route, Black-throated Sparrow and Ash-throated Flycatcher. We then coasted down to the bottom of the hill and waited for Audubon’s Oriole to sing. It did at 0640 hours and we raced off. A Blue-gray Gnatcatcher mewed and a Cactus Wren growled as we clicked off our brush country birds. The White-crowned Sparrows were still hanging in and that allowed us to pick up speed planning to get most all the other area residents “on the fly”. Vermilion Flycatcher, Lincoln’s, Chipping, and Grasshopper Sparrows, Bullock’s Oriole and more fell into place. As we neared SH281, we were only missing Verdin, our “staked” Bell’s Vireo (which failed us) and American Kestrel. An unscouted Bell’s sang as we wheeled our way east and a Verdin finally sang in the last possible patch of suitable habitat. The kestrel would be one of the surprise misses for the day. By the time we left the town of Orange Grove just before 0900 hours, we had tallied a very respectable 80 species. The interesting thing about a Bicycle Big Day of this length is one has no time to stop and tally the birds. We knew we had done well on the brush country run. But, we had no idea of how many we had seen at the time. We were averaging around 20 mph during the first stretch of the 20 mile ride to Calallen. But as the rolling hills gradually wore us down and the light winds turned towards our direction of travel, we slowed to a lower pace. The weather began looking more dismal with an intermittent mist and the threat of real rain apparent ahead. We made our only stop at the Wright Ranch Pond where we added Anhinga, Roseate Spoonbill, and Double-crested Cormorant. We had decided before we even began the day to bypass Hazel Bazemore County Park and check the sod farms for grasspipers. We got our first hit of shorebirds there along with very pink Franklin’s Gulls, but would add only one bird we would not see later, Pectoral Sandpiper. Pollywog Pond was our next stop and our last hope for Carolina Wren. No wren, but we did add both Belted and Green (lucky bonus) Kingfishers, and our first warblers – Northern Parula, Yellow-breasted Chat, and Common Yellowthroat. Our next major stop, Rose Hill Cemetery, would tell us what potential this day would have. If Rose Hill did not have migrants our day would likely not be a record breaker. Fortunately, Rose Hill was very birdy. In a single tree, we had 10 Chuck-will’s-widows fly out as we approached it and Great Crested Flycatchers seemed to be in every tree. We found a nice roving flock of warblers adding 7 new species including Golden-winged and with them were some other goodies including Acadian Flycatcher and a late Ruby-crowned Kinglet. Unfortunately, the Lesser Goldfinches that had been frequenting the park were nowhere to be seen or heard. We zipped over to nearby Blucher Park to get our understory warblers and were not disappointed adding Kentucky and Hooded straight away. We also added both migrant orioles, Baltimore and Orchard, Scarlet Tanager, and a Least Flycatcher among others. We left for the bays and beaches with 145 species already in the bag. After a 9 mile ride along Ocean Drive in Corpus Christi we arrived at the Texas A&M Corpus Christi campus where the closed road to the adjacent Naval Air Station was filled with hundreds of people watching an air show. The bay was filled to the gills with water pushing all the shorebirds and terns into a small area where we could view them. There we added all 4 small plovers (Piping, Snowy, Wilson’s and Semipalmated), several terns including our only Black of the day, Whimbrel, and Marbled Godwit while fighter jets roared upon takeoff just a few hundred yards away! We next rode over to South Padre Island Drive (SPID – SH358) which gave us more ducks and most importantly American Oystercatcher and Long-billed Curlew at its Oso Bay crossing. As we rode towards Mustang Island on the SPID, our first major obstacle of the day became evident. We felt cold air overtake us with the temperature easily dropping 15 degrees in a matter of seconds. An ominous wall cloud was immediately behind us. We hurried onward hoping to take the JFK causeway bridge before the heavy rains drenched us and made that high arching bridge with a shoulder of only 18 inches even more of a safety concern. We no sooner crested the bridge than the rains came thundering down. We zipped into Packery Channel and found cover. It looked like a hurricane scene with sheets of rain seemingly “falling” horizontally. The good news was the violent part of the storm front passed within 10 minutes. It allowed us a quick break and the chance to catch up on eating and drinking. One of the greatest challenges of a day such as this is keeping hydrated and fueled as we push the pace all day long. The amount of calories one has to ingest (mostly simple sugars for quick return) is obscene and must be done without wasting time – my triathlon gels came in very handy. As we waited it out, I knew the frontal passage might prevent us making our final destination, Port Aransas. The problem was we had already biked over 100 miles and the next 15 would into the teeth of a 15 to 20 mph wind. We took frequent mini-breaks as we struggled to maintain an 11 mph pace. Mustang Island did have tremendous freshwater habitat due to the abundant rains that had poured down all spring. The ponds yielded us some bonus birds like American Wigeon and Ring-necked Duck. About half way down the island, I told John we would take a longer break and check a small stand of willows for migrants. That paid off handsomely as we added our most unexpected bird of the day, a late Yellow-bellied Sapsucker along with Yellow Warbler, Warbling and Red-eyed Vireos, and Swainson’s Thrush. We left not knowing we had pushed our total to 175 species. By virtue of cutting our beach check – we never saw the Gulf of Mexico even though it was only a ¼-mile away – we had managed to be on schedule! This meant we would have almost two hours of light to bird Port Aransas. Then we were given another break. As we moved back onto the highway we discovered the winds had swung around so that it was hitting us from the side instead of head on! This made the remaining ride downright pleasant. Even though our staked Lesser Scaup had left their pond, we hit Port Aransas proper with 179 species adding Snowy Egret, Sora, Mottled Ducks and Spotted Sandpiper on the ride in. Our first major stop was the Turnbull Wetlands Center. Number 180 was a Western Sandpiper on some wetlands on the way in. We were in luck – the long staying male Cape May Warbler was still there and allowed us to tie the current record at 181. A minute later we added an American Redstart to set a new standard. In at the tower we added our only Tree Swallow of the day along with another bonus duck, a female Northern Pintail. Marsh Wrens also began singing. 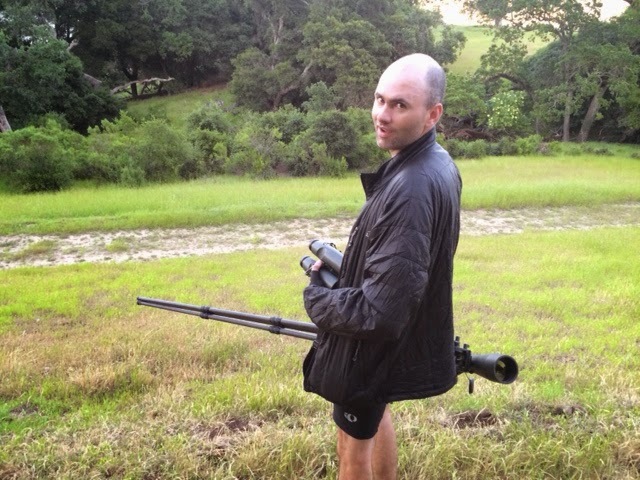 But where were the Common Gallinules? After some tense moments, John spotted one along the marsh edge and we headed off for Paradise Pond. Unfortunately, it was dead and we quickly moved to our last location, Charlie’s Pasture. This brackish flats area is an amazing birding location for water birds. We added a singing Sedge Wren as we started down the trail and our Horned Lark was right where it was supposed to be. Semipalmated Sandpiper was further out the boardwalk and we settled in at sundown on the tower overlooking the marshes. Even though it was not a new species for the day, the group feeding flock of 30 Reddish Egrets (both color phases) was an amazing spectacle that has to be mentioned. We searched in vain for White-faced Ibis and Little Blue Heron, but did add some Lesser Scaup for species 190. On the way back in after sunset, we heard Solitary Sandpiper and Black-crowned Night-Heron and flushed some Wilson’s Snipe for our last bird of the day. We tried in vain to add Virginia Rail back at the Birding Center, but our clapping (no tapes allowed for the Birding Classic) could not even tease a Sora into calling. We stopped and counted up the birds before quitting. We knew we could potentially add Clapper Rail, but that would be a 7-mile ride in the dark. After logging 122 miles on our bikes, we were tired and decide to call it a day at 2100 hours. What a day it had been. We logged 193 species by ABA Big Day rules without the aid of fossil fuels, bird recordings, or lights to illuminate birds. 188 were seen or heard by both John and myself. Before the day began, I was unsure whether we could complete the full route given the length and the unknowns of weather, flat tires, etc. For those who might be interested, we rode the entire day on standard road bikes equipped with 23 mm-wide Kevlar fiber re-inforced tires. So, is 200 possible? Yes, if we can maintain the enthusiasm for such a physically taxing endeavor. I am 52 and not going to get any younger. John is only 19, but has college as a first priority. But the potential is certainly there. I listed 40 species that I thought we had a reasonable chance of getting but missed on the day. These included such obvious additions as Clapper Rail, Ring-billed Gull, Eastern Kingbird, Carolina Wren, Cedar Waxwing, and Rose-breasted Grosbeak. One will always have many misses with such a tight schedule, but some day 200 will happen on the Texas coast. This new route had a lot of potential, but also a lot of unknowns. Would we find the regular owl species? How could we replace the typical Santa Cruz mountain species, considering our low crossing at 92? Would we be able to keep to a schedule to even make it to Calaveras Reservoir? It turns out that we succeeded on all three of those fronts. Combined with nice weather, shorebird migration, and a few surprises, we ended up with a great total. I'm sure that improving is possible on a good day (and in a good year), but with such a huge list of possibilities, we'll always have a lot of misses as well. We left from my house in San Mateo at 1:10am. The first bird of the day was a GREAT HORNED OWL calling from the far slope of Crystal Springs Reservoir. Soon after, we added singing GRASSHOPPER SPARROWS by the first streetlamp on Canada by the intersection with 92. (There appear to be at least 3 pairs potentially breeding here.) Heading up 92, we heard a distant NORTHERN SAW-WHET OWL from the rich, wet area near the pass, on the south side of the road. That ended our owling for the pre-dawn, as we had already left screech-owl territory, and we couldn't linger too close to dawn along the Half Moon Bay part of 92 due to timing constraints. We easily heard VIRGINIA RAIL at the Pillar Point marsh. By about 5:20am we were riding alongside the airport, hearing SAVANNAH SPARROWS. Fitzgerald Marine Reserve took some time to warm up, but eventually offered a surprise GOLDEN-CROWNED KINGLET, as well as ALLEN'S HUMMINGBIRDS, WILSON'S WARBLERS, and a DOWNY WOODPECKER. Our Moss Beach seawatch began at 6:15am. Not a ton of birds close, but we did find all three loon and cormorant species, SURF SCOTERS, COMMON MURRE, and PIGEON GUILLEMOT. No magical surprises here. As we headed to the western edge of the harbor, a singing YELLOW WARBLER by the Princeton willows shocked and energized us. Some warbler flocks descended into the trees. Mostly YELLOW-RUMPED WARBLERS, but at least one TOWNSEND'S as well. Tucked into the corner of the harbor were hundreds of SANDERLING and many BRANT. We never managed to find any of our stakeout Common Goldeneye, but we would find that bird later. We pushed on to the Pilarcitos Creek Mouth. This offered our only RED-BREASTED MERGANSER of the day, as well as some flyby BLACK TURNSTONES, and an okay diversity of gulls. HERRING GULLS had been passing north in small numbers, and there was a second-cycle THAYER'S GULL on the beach. The gull showed a nice short bill that was nearly all black, a round head, a moderately dark mantle, pink legs, very worn primaries and coverts that still showed some nice contrast between a pale underside and darker upperside. We swing by Malia DeFelice's house to look for her stakeout Lincoln's Sparrow, but not luck there. We would end up dipping on all of our stakeout wintering sparrow species. Riding up 92, we enjoyed BLACK-HEADED GROSBEAKS and a PACIFIC WREN. The wren was a welcome bird, since we missed it at Fitzgerald and it was going to become very difficult after we began climbing the higher part of 92. At the intersection of 92 and Skyline, we pulled into the rest stop to hear the local breeding MACGILLIVRAY'S WARBLER. It was a bit further downslope than usual, but it was calling away. Inside Skylawn Memorial Park, we made short work of a VARIED THRUSH on the lawn, OLIVE-SIDED FLYCATCHER singing from a pine, and RED CROSSBILLS calling. We hustled out and rolled down to the Crystal Springs Reservoir. RING-NECKED DUCK numbers had slightly increased since Friday, with 4 birds on the southern end of the lower reservoir. Scanning the upper reservoir, we found BELTED KINGFISHER and a COMMON MERGANSER on a spit. Josiah and I each found our own SPOTTED SANDPIPER flying across our scope view. A SHARP-SHINNED HAWK was heading north along the ridge of the Santa Cruz Mountains. Passing Filoli, we heard 2 different WESTERN WOOD-PEWEES, while another OLIVE-SIDED FLYCATCHER call from the distant slope. LAZULI BUNTINGS sang from a few locations, and ASH-THROATED FLYCATCHERS were common. We failed to find Blue-gray Gnatcatcher at our stakeout spot, which we would miss for the day. Now we did our suburban sprint, adding only CEDAR WAXWING, WHITE-BREASTED NUTHATCH, and HOODED ORIOLE. Along the bay, we quickly spotted an immature COOPER'S HAWK being harassed by CLIFF SWALLOWS. We rolled out to the San Francisquito Creek mouth, and it was on! The falling tide had revealed a moderate amount of mud, and 12 species of shorebird were foraging. The highlights were ~20 RED KNOTS, and 2 LESSER YELLOWLEGS showing their shorter, thinner bills, as they pranced along the water's edge. Ducks included 2 CANVASBACKS, 50+ NORTHERN PINTAILS, and a few AMERICAN WIGEON. RIDGWAY'S RAILS called from the San Mateo side of the creek. With such success, we skipped Palo Alto Baylands and the outer flood control basin altogether. Instead, we traveled down Geng Road, finding the GREAT-TAILED GRACKLE, then headed along the frontage road to the north pond of the flood control basin. The 2 GREATER WHITE-FRONTED GEESE were still there! A quick pass through Charleston Slough offered some CINNAMON TEAL but not much else. BLACK SKIMMERS were on Shoreline Lake, but we failed to locate the Ross's Goose. We had already found several Green Heron, so we skipped out on Charleston Marsh. Instead we enjoyed the BURROWING OWLS at the kite-flying area, and headed to Moffett Field. No sign of Ring-necked Pheasant, but SAY'S PHOEBE was a welcome trade. In Crittenden Marsh there were 2 SNOWY PLOVERS, a HORNED GREBE that still had a very dark neck, and young male COMMON GOLDENEYE. Pond A2E had a few dozen BONAPARTE'S GULLS. An AMERICAN WHITE PELICAN was on an island in AB2. Not much to be found through Sunnyvale. 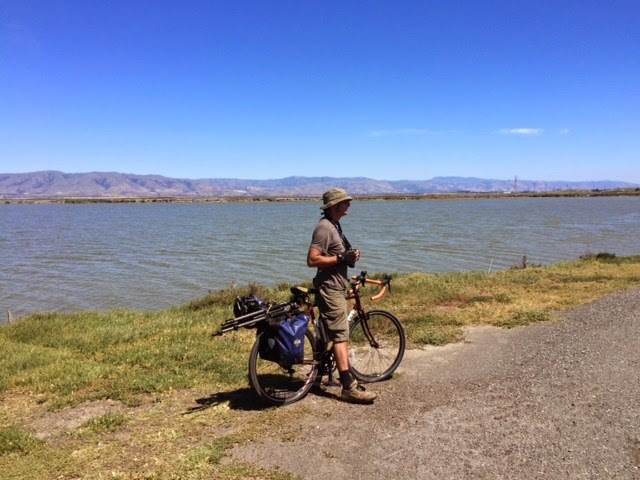 We reached Alviso around 3pm. Heading to the marina, we felt so lucky to hear a BLACK RAIL in the marsh, and a few RED-NECKED PHALAROPES were in the SE corner. We took the levees over to A16, but didn't find anything new. Mallard Slough offered COMMON GALLINULE, but no Blue-winged Teal. We began to get nervous that we would miss Peregrine Falcon... and we did end up missing it for the day, just like last year. However, we traded that for a MERLIN as we rode through Milpitas. We skipped birding along Coyote Creek north of 237 because we had already found Yellow Warbler, Downy Woodpecker, and Red-shouldered Hawk. All that hustling pays off when you reach a nice, new habitat. We made it to Old Calaveras Road, and quickly found LOGGERHEAD SHRIKE and RUFOUS-CROWNED SPARROW. Sitting under an oak on the Tularcitos Trail, we enjoyed watching a CHIPPING SPARROW fly out and perch on a wire. It was in the area for the next 10 minutes while we ate like pigs and drank like camels. A GRASSHOPPER SPARROW sang from the other side of the road. Reaching the Elm Picnic Area, Josiah enjoyed a passing WESTERN TANAGER while I was indisposed in the bathroom. A dirty bird -- one of only two for the day (the Townsend's Warbler was the other). The rest of Ed Levin was pretty quiet. We kept an eye on kettling Turkey Vultures, but never detected any rarer raptors. The final daytime push up Calaveras to the reservoir was exhausting, but visions of magpies kept us going. Indeed, YELLOW-BILLED MAGPIE was the first new bird in this stretch. Soon after, the LEWIS'S WOODPECKER previously found by Mike Rogers was on a post by the first house up the hill after Calaveras turns northeast at the intersection with Felter (not the house at the intersection, but the house after you crest the hill after the intersection). ROCK WRENS sung from several rock piles, but no Lark Sparrows showed up anywhere. BROWN CREEPER had eluded us on the coast-side, but we knew exactly which wooded draw had some birds waiting for us on Calaveras Road. We then enjoyed a BALD EAGLE, and began to really scan the reservoir. Unfortunately, no new birds there, although there were still many Bufflehead, and a few Northern Pintail. We waited until dusk, and started heading down, appreciating calling BARN OWL, NORTHERN PYGMY-OWL, and WESTERN SCREECH-OWL. This helped fill out our owl count after a slow owling morning. Our strongest possibility after dark was Sora, but we didn't manage to find any. So we continued to push north. By midnight we were riding through Menlo Park, and we made it home around 1am. Just 24 short hours. This new route has its benefits and costs. We managed to replace most higher elecation Santa Cruz Mountain birds with the help of Skylawn, Canada Road, and some lucky migrants here and there. Getting some more difficult ducks on the coast, plus all the true ocean species (loons, other cormorants, rocky and beach shorebirds), helped us to move faster along the bayside, since we didn't need to find a lot of ducks. But the most important factor by far was getting the right tide at San Francisquito Creek. It has often offered us Red Knots in late spring, and it has such a diversity of shorebirds and ducks that it saves you time trying spot after spot for particular bayside birds. On the downside for this route, it's incredible fun to spend the whole morning riding trails in the mountains as in previous years, instead of riding along 92. This isn't a route I'll necessarily want to try every single year. Our big misses this year: Ring-necked Pheasant, White-tailed Kite, Peregrine Falcon, Lincoln's Sparrow, Lark Sparrow, Blue-winged Teal, Blue-gray Gnatcatcher, Rufous Hummingbird. Other reasonable or stakeout birds that we missed include Ross's Goose, Redhead, Eurasian Wigeon, Sora, Surfbird, Wilson's Snipe, Heermann's Gull, Calliope Hummingbird, Pileated Woodpecker, Cassin's Vireo, Ruby-crowned Kinglet, Hermit Thrush, Nashville and Hermit Warbler, White-throated and Fox Sparrow.